The Rich Text block displays multicolored differently formatted texts. It is used exclusively for documentation or comments. Theoretically, each letter can be assigned a different font size, a different style (bold, italic and underline) as well as a different foreground and background color. The sections are aligned left, right or centered. In addition, texts with other fonts and other formatting can be inserted via the clipboard from applications such as Microsoft Word into the parameter dialog and displayed in the block. However, some formatting can be displayed differently or lost. Before using other fonts, keep in mind that they are available on all computers where the project is used. 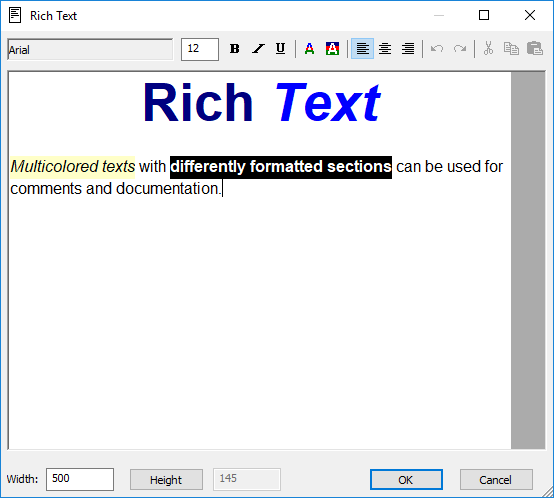 The block stores the texts in Rich Text Format (RTF). The maximum storage capacity per block is 30 kbytes. In addition to the plain text, each formatting consumes a portion of the space provided. Therefore, the maximum length of the text depends on the number of formatting. The block size is limited to 2500x2500 pixels at zoom level 1.0. The text is edited in the parameter dialog. The dialog can only be opened in edit mode. Different font sizes, styles, colors and alignments are assigned to the selected text with help of the toolbar. In addition, a multi-leveled undo and restore is available. It restarts each time the dialog is opened. The clipboard commands copy or paste the selected text sections in rich text format. The width of the block is set by dragging the right edge of the text field or in the input field below. The block height is normally calculated automatically. By pressing the "Height" button, the associated input field is enabled to specify a fix value. Width and height must be assigned by 5 divisible values in between 20 and 2500. They are automatically adjusted if necessary. As a result of the uneven enlargement or reduction of the letters during zooming, the positions of the line breaks and thus the representation of the texts can change considerably. This also affects printing, which automatically zooms according to the selected worksheet size and printer resolution.